This morning, I wandered over to the Guildhall in the City of London to watch the annual Cart Marking ceremony, which can trace its roots back a good 500 years. 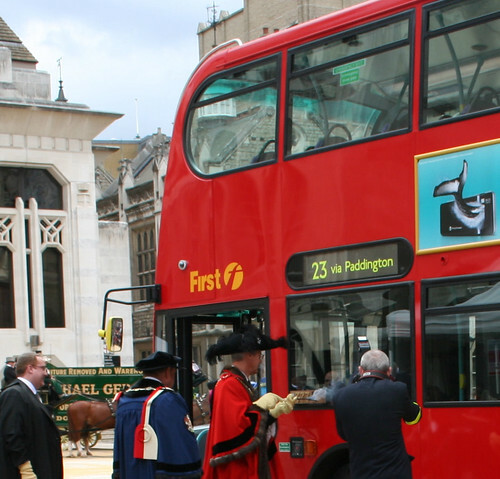 The Cart Marking is carried out by members of The Worshipful Company of Carmen, which is one of the Livery Companies of the City of London. Originally formed in 1517 as the “the Fraternyte of Seynt Katryne the Virgyn and Marter of Carters” – although its heritage can be traced back to around the 1300s – the livery company controlled the supply of carts and wagons in the city and each year, they branded a cart with a year mark to certify it as valid for use within the city. In exchange for their monopoly control, they were then required to keep the Kings Highways clean of dung and rubbish – and convey goods at a reasonable price. 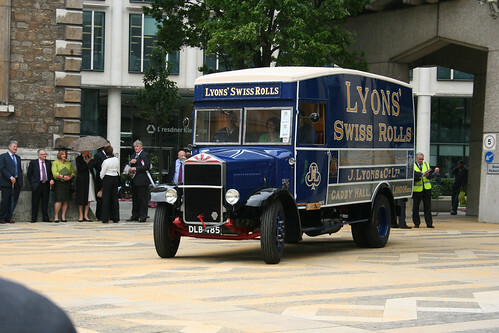 In 1838, the rights to control vehicles was passed to The Keeper of Guildhall, and today is not exercised at all. 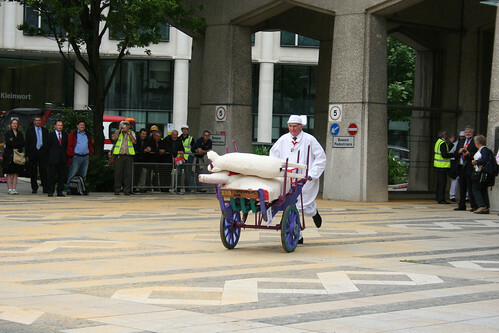 However, as one of the City’s traditions, the Cart Marking itself is still carried out each year – and a parade of notable vehicles passes though the Guildhall Yard and a wooden board on the vehicle is branded with a hot iron with a yearly marker. Today, a total of 46 markings was planned – and the attendees ranged from a hand drawn cart to the latest London Transport Bus so it was quite a varied morning. After arriving around 10am, I was able to secure a good seat to watch the proceedings and picked up a guide and waited for the fun to start while watching fine ladies in summer dresses and gents in city livery wandering around. At 10:30, a speaker started telling us about the event and its history and with a fanfare the Master of the Carmen arrived with his assistants. A small ceremony was carried out where the gloves are handed out to permit the branding irons to be held without burning the person and after a short speech, the Marking started. In essence, a vehicle entered the yard from one side, drove up to the main dais and there a dignitary would be handed a branding iron and burn a R mark into the wooden plaque to signify this years marking. It was difficult to get close up photos of the branding of the wooden plaque itself as there were quite a few official photographers around, but I saw enough and you could occasionally get a strong whiff of burnt wood. Some of the vehicles were evidently regulars as they had many previous years marks, but there were a quite a few brand new trucks and even a bus which were new to the ceremony. About half way though, the Lord Mayor of London arrived (we all had to stand) and he then joined in the ceremony. A commentator gave a running speech though out explaining the history of the older vehicles, or pointing out innovations in the modern trucks which came through. A few very notable visitors was a hand drawn cart from Spitalfields Meat Market, a Rolls Royce which had accompanied Montgomery on the D-Day landings (inc the Chelsea Pensioner who drove it on that landing day) and quite a few heritage busses and some lovely Shire Horses. Once all the Carts had been Marked, there was a run through by all the vehicles again and then the event was over. It’s a nice bit of heritage which surprisingly few people seem to know about (it isn’t that heavily publicized to be honest), but as it is also the main fund raising day for the charity which is run by the livery company, it is quite important to the Carmen. While the Livery Companies have mainly lost their monopolies over trade, they still act as trade bodies to promote their wares and do a heck of a lot of charitable work. The Worshipful Company of Carmen is still active though in promoting transport matters and has quite close links with the military. It was a very pleasant morning – all the more so for being free to watch in comfort, but also a nice reminder of just how long institutions can last if looked after. Lots of photos at my usual Flickr account. 2 Pings/Trackbacks for "Cart Marking"